The Digimon Reference Book profile for November 20th, 2015, is Nise Drimogemon. A translation is provided below; you may use it freely on forums, wikis, etc. so long as you link back to or cite this page. 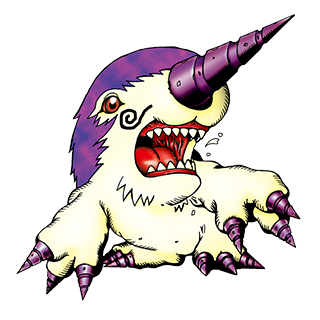 Profile: A Digimon that's the spitting image of Drimogemon, which it was decided would be called "Nise" (counterfeit) because of its shady mustache. If this Digimon had been discovered earlier, Drimogemon would probably have been the one called "Nise." Its special attack is to boar into the enemy with its massive nose-drill, "Nise Drill Spin." The Digimon Reference Book is Bandai's official bible on the various Digimon species, first launched in 2007 and now comprising over seven hundred different Digimon out of the thousand-plus species that exist. It updates weekly with new Digimon profiles. Last week's profile was Dinotigermon. No, that's a typo on the OP's part. "Perfect" was left over from pasting the template I use for Reference Book posts.